How great that your conclusion was to just do what you wanna do! When we do that...we do our best. I will be the first (of many I am sure) to say that I would love to invite your new friends to live in NYC. I bet they would like it here! They can come and live with me in Florida also. When looking closely at the pictures, I fell in love with the deer. Is it on a map? Loved it! I agree with your sentiments, Lynne - they accord with mine closely. I make what I want to make most of the time. Unfortunately, the need to put food on the table means that sometimes I have to do other stuff - bread-and-butter stuff - that is an entirely separate category to the art that I make because it is a need in me. Gee, what a ramble! Do you get what I'm saying? 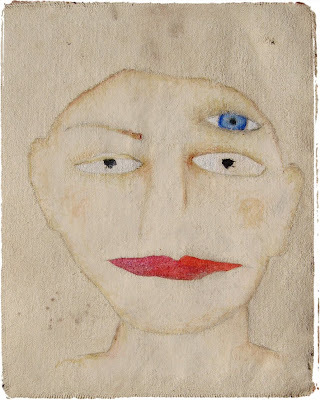 Oh yes - I really like your little paintings on fabric and would give one a good home if I were lucky enough to win one! Oh yes, please I would like to fill out the adoption application for these wonderful paint children! I can offer them a home with a pond and a barn on the delightful Salt Spring Island. Did I mention we have the neighbourhood toboggan hill. What more could these delicate 3 eyed children want? susie, i think i completely 'get' what you're saying. i so admire people like you who can do both... to me, that's the best of both worlds. i want everyone who reads this to know that i'm not putting artists who make their living from art down, but rather questioning why we stop making art altogether if it doesn't make money. I remember reading a passage about what makes an artist a success. And I really had to stop and ponder this. I was assuming I was not successful because I wasn't making much if any money at my art. but then I asked myself the question directly and was very happy that money wasn't what motivated me to do art. Doing art makes me happy, so I do. :) This was a light bulb moment for me and I feel much freer now that I can make what pleases me and not feel any guilt about making what I think someone else might like (and might not). I adore them, but you knew I would. I had an epiphany years ago when my parents took me with them to Paris to celebrate finishing my MFA. 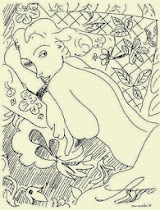 We were at the Muse Picasso, and as I walked thru that amazing and truly awe-inspiring collection of work by one of the Gods in my Art Pantheon, I realized deep in my heart and soul that it didn't matter if I never sold a thing; it is the making of art that matters, expressing my own true voice visually. This is an important topic. Thanks for bringing it up. (and count my hand up to have my name drawn to adopt your two new darlings). Lynne I would love to have your two ponderful people living with me! Please put my name into the lucky draw. Talking about the selling aspect.... First of all I would have to get a "real" job if my art stopped selling and I would much rather create art than be stuck in an office. The other thing is if someone is willing to pay for your work then maybe it means you really are an artist. Silly I know but that did pass my mind when I first started selling. I do know where you are coming from though and the actual creating of my pieces... the zone I get into ...is what its all about for me. I just love that feeling of disappearing into my own little world and find it miraculous that artists can create something wonderful from virtually nothing. i think the hardest thing to do is to figure out how to keep asking art when you have to sell it. love these extra eyes. oh, you can send the two also to me - I would love to invite them and what things might be seen with these special eyes? 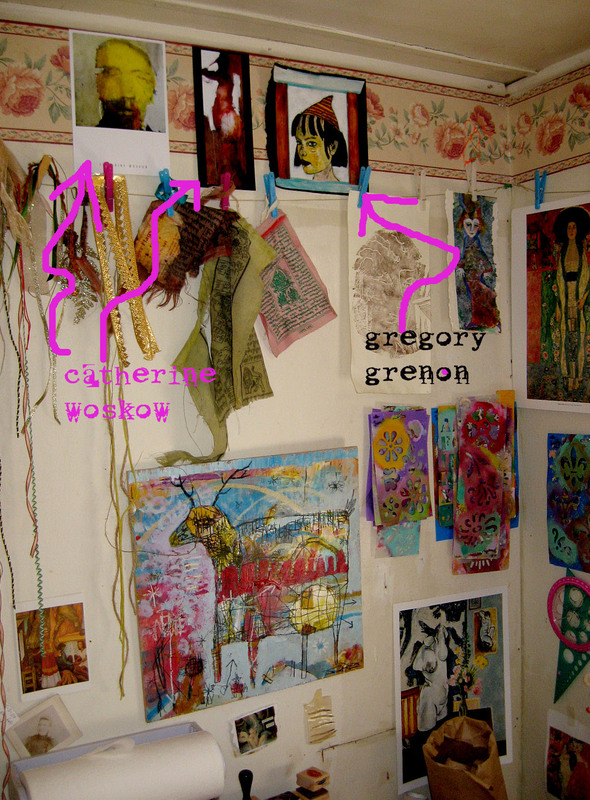 Interesting to see your walls - very coloured and playful - but I wouldn't expect somehting else ;-). I had a look at the paintings of Catherine Woskow - great! If we can find/open veins of self discovery, enchantment in our lives/ makings. We R Blessed. That bliss of Suchness rising up, witnessed. Yes. Of course am thinking of Henry M. Vincent ! Yes, goat promises never to chew the ears of your beautifuls, if they choose the warm sultry fall. I am looking forward to the beach again after this long holiday as tourists clear. It is the opening of Birthday month and many Blessings from opening portals of soul gift light and Love. To you. Ps. Love. 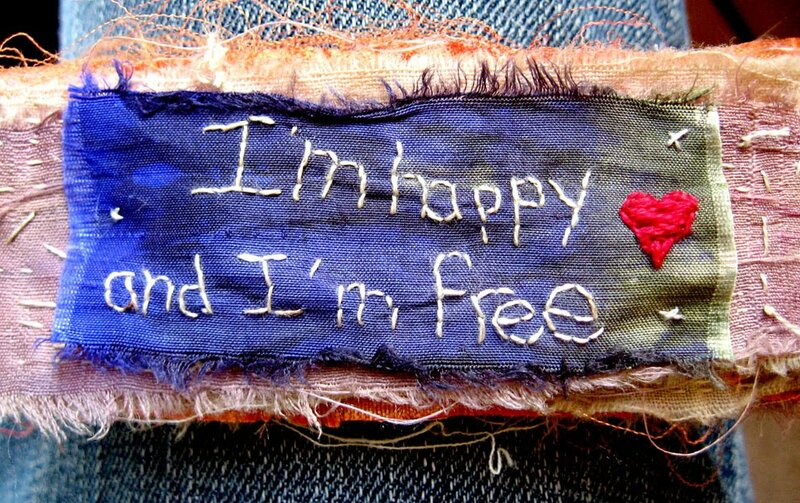 I am happy I am free. And that k worskow link. ! I suppose each of us has to make that decision for themselves. If you can make money from your art that is wonderful. Personally I became very depressed when I had an etsy shop and never sold one stinkin' thing. I was ready to give up but instead I gave most of my art away and started making new art. Now I am happy again and I don't care if anyone else likes it or not, I don't sell it but continue to give it away to people who seem to like it. I'm self taught entirely and consider myself an artist since that is what I do. Everyday. If your people came to live with me I wouldn't be sad about that;-) I would give them their own space. I agree 100%!!!! 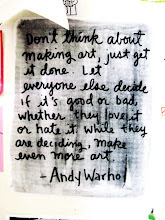 Art should be made for the sake of art: to enjoy the creative process and experience. I'm glad I'm not the only one who wrangles with these 2 issues - all i know is i'm happiest with the work i produce when i don't think about it's selling potential. 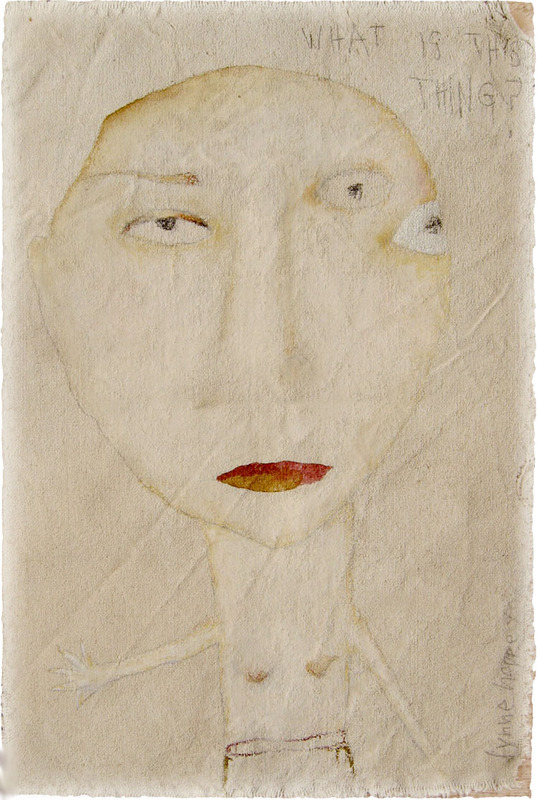 I don't understand people who only rate trained artists either - I work with artists who have learning difficulties and visual impairments, none of them are 'trained' in a formal sense but their work blows me away. They can come and live in Kentucky with me, where they would not be the only one with a wandering third eye! The "making money" dilemma, I think, comes from the outside world rather than from the artist. It somehow legitimizes the art in their eyes, because our society is totally obsessed with money. Just remember this: Van Gogh sold only one painting in his life. 'Nuf said. always love what you have to say here. I feel so very free to create whatever I have in my head without regard to selling it...the recognition is a nice thing though, that someone appreciates what spills out. It is nice to know that the world around us is full of mystery and hope. Thank you for this post because it is so true. I would love for them to come and live at my house. Because my walls are still empty craving for art. How generous of you! These faces would be treasured at my house. Your art never fails to move me. well you know I love doing giveaways and I love winning them too! would love to welcome this couple in my home! I love selling my work, it seems like an honor when someone buys something that I have created because they recognize the value of what I believe is an important creation. and I have never... once regretted that I am not formally trained. bravo! to doing whatever you want... I feel the same!! Hi Lynne- I think the difference here is, "I want to be an artist..." vs the people who just ARE artists. I know for me sometimes when work isn't moving out it can make me feel a little 'constipated'. There is a feeling that you maybe your work isn't 'communicating' and some discouragement. It is ideal to have the self belief to keep going and doing what is true for you. I think most artists do persist. But it isn't like we aren't allow a bit of a sulk as well. teehee. yes, Yes! Art is about the person making it, not the one buying it. Your work reflects your thoughts and your experiences --and that's what makes it yours. Howdy! I have room for these guys in Maryland. Want to pick my name out of the hat? It would be okay with me! it is quite wonderful to imagine you smiling as you completed your wonderful artfull pieces. 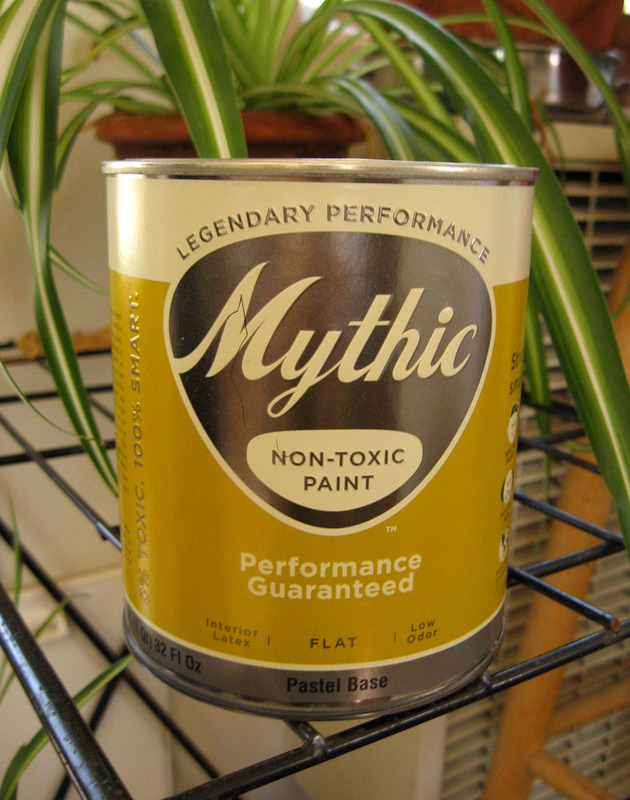 Yea to the Mythic paint. Do you think you will also use it as paint in a painting instead of just a primer? I love your tie! It is so appealing to me. I think it is the layers and colors, champagne and sunset, the stitches the burn holes, an ancient feel. And I can see that it is yummy shiny silk. i like the regular teaching job paycheck. if we could make without the constraints do you think it would weaken the work? i think frission and tension are necessary. annoying, as well. ultimately it's the making that matters to me. once it's done, it's gone. great if it sells. these portraits heads are wonderful with their eyes. just wonderful. I understand perfectly what you are saying, and have felt it -- that reluctance to call myself an artist because I don't have the formal training. But somewhere along the line, I've become okay with just making the stuff I want to make. Really okay with it. In fact, it is kind of freeing, isn't it. Love your work, and would love to see it my house! It is funny to read your piece about being a real artist or not. I was self taught until l went to Art College at 49 (long story!) and did a 5 year p/t Art and design degree. I don't feel a better artist but other people now see me as a "proper proffessional" artist becuase l have a degree...really stupid!! Also l make work because l want to and have to..it is in my blood. money is amazing but l still do it when l am not paid!! Anyway...l would LOVE a peice of your work....even a tiny scrap would do...just adore your faces. Wow! Just a big ol' huge WOW! You have said here exactly what I needed to hear (read?) today. Thank you...thank you so much. And I would LOVE to be honored with one of your all seeing folks so please count me in. Lovely post Lynne. You've hit on things that I struggle with all the time. Sometimes I just want a needle and thread and a quiet cave to live in. No outside pressure. Then at other times, it's the outside pressure that moves me to new creative territory. Always a dilemma. Of course, I'd be thrilled to welcome your faces into my home, with their extra eye for additional insight. 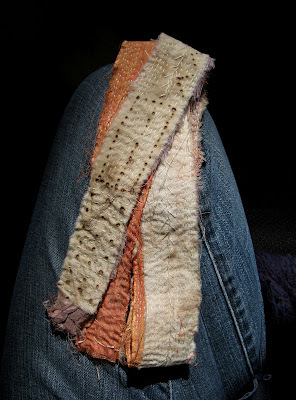 Wonderful stitching you've been up to lately! I think that I will definitely win this one. Did you see that painting on my sidebar? The one with "the eye"? Doesn't it just MATCH these two. They say that you always need to hang things in groups of 3 or 5. I have the 1, you can add 2 and 3 and make it complete! Great stuff Lynne. Word verification is: monsing. Doesn't that just say it all? Love the third eye... I invite them in to my studio to help keep my vision clear. This topic is so pertinent for us all. I don't even try to sell my art - I always think - who would buy it and what if they decided after a time they didn't like it anymore - would they throw it away? You know I would love a couple of "Lynne-y's Originals" in my little Bend house -they would have a place of honor, and there are a few 3 eyed children around here for company! lynne i am really late with this and haven't been able to do lots of reading, but i'm well now and i'm loving these photos and I love that pic of your wall. i think when just about anything gets inexorably wrapped up in payment something weird happens. i've never sold anything, not that i wouldn't, but if i didn't paint i'd be in major trouble. it has become my life in a very real way, even when i am not able to do it for reason of time or health or venue, i am thinking about it, looking at art, and imagining images translated on surfaces with brush pen or pastel. i would so hate for that passion to be mitigated by a need to put a price on it. Frankly, it's the main reason i haven't opened a shop yet.